People living with disabilities, their families and carers working in partnership with local voluntary and health and social care organisations make a valuable contribution in ensuring inclusiveness and equality in society. 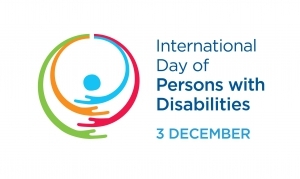 This was the key message from an event held on 3 December 2018 at the Long Gallery, Parliament Buildings to mark International Day of People with Disabilities. Click here to view our photo gallery from the event. This regional event, organised by Disability Action in partnership with the Health and Social Care Board and the Department of Health, showcased many initiatives developed and implemented through the Physical and Sensory Disability Strategy for Northern Ireland. It also recognised the valuable contribution and involvement of local people, themselves living with disabilities, who reflected on their experiences of working throughout the implementation of the Strategy. Speaking at the celebration, Marie Roulston, Director of Social Care and Children’s Services with the Health and Social Care Board, said: “The aims of International Day of People with Disabilities are to promote understanding of disability issues and to advocate support for the dignity and well-being of people who live with disabilities. These resonate with the vision, objectives and values of the Physical and Sensory Disability Strategy. The initiatives highlighted today represent how the Strategy and Action Plan addressed these aims. They reflect the diversity of the investments made over the lifetime of the Strategy by the Health and Social Care Board. The Strategy addresses the needs of all age groups, children and adults, regardless of the cause of disability. For this reason, over the lifespan of the Action Plan, investments have been made to develop and sustain services for people with physical disability; sensory disability including hearing impairment and sight loss; communication disability and neuro-disability including Acquired Brain Injury. Examples include Social Networking and Community Access, the Eye Care Liaison Service, Hearing Aid User Support Service, Tinnitus Service, Augmentive and Alternative Communication Equipment and Services, the consolidation of Brain Injury Services at Spruce House and Musgrave Park Hospital outreaching to Thompson House in Lisburn. Looking to the future, Colin Dunlop, Head of Physical and Sensory Disability Policy Unit at the Department of Health, said: “In 2012 the regional Physical and Sensory Disability Strategy set our direction in supporting disabled people to better exercise their rights, choices and life opportunities. Through a multi-agency approach, involving the Health and Social Care Board (HSCB), Public Health Agency, HSC Trusts, other government departments, and the voluntary and community sector, the Department of Health adopted a life cycle approach to service provision and support, recognising that people living with disabilities will have changing needs throughout their lives. The regional NI Strategy for Physical and Sensory Disability (2012-15) can be viewed on the Department of Health website. The Strategy and Action Plan was originally launched by Minister Poots on 22 February 2012. An extension of the Physical and Sensory Disability Strategy and Action Plan was announced by Minister O’Neill in September 2016. The Strategy sets out the strategic direction for the further development of services and support for disabled people and the Action Plan contains the key actions for the delivery of these services and support.